Dirk Koetter has served as Falcons offensive coordinator for three years. 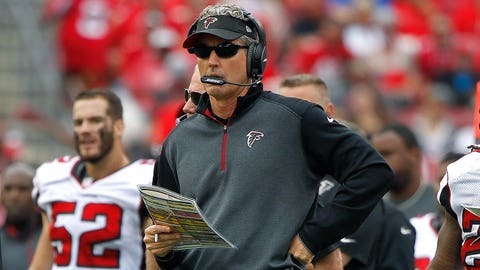 Atlanta Falcons offensive coordinator Dirk Koetter is expected to interview for the same position this weekend with Tampa Bay, a source told FOX Sports. Koetter is considered a strong candidate to replace Jeff Tedford, who left the Buccaneers to become head coach of the CFL’s B.C. Lions. Koetter, 55, already has previous ties to Bucs offensive line coach George Warhop. Both were on the same Boston College coaching staff under Dan Henning in 1994 and 1995. It also doesn’t hurt Koetter that Atlanta scored 56 points against the Buccaneers in a Week 3 victory. The Bucs, however, could have competition for Koetter’s services. A source told FOX Sports that Koetter is held in high regard by two other head coaching candidates: Seattle defensive coordinator Dan Quinn and San Francisco defensive line coach Jim Tomsula. Quinn and Tomsula both have already reportedly interviewed with the 49ers for the vacancy created when Jim Harbaugh left for the University of Michigan. Quinn is expected to speak with several other teams during Seattle’s bye week before a second-round playoff game. The Falcons were ranked in the top eight in offense during two of Koetter’s three seasons with Atlanta. A former head coach at Boise State (1998-2000) and Arizona State (2001-06), Koetter also was Jacksonville’s offensive coordinator from 2007-11. The Tampa Bay Times reported that San Francisco offensive coordinator Greg Roman, New York Jets offensive coordinator Marty Mornhinweg and ex-Chicago Bears head coach Marc Trestman are also under consideration by Bucs head coach Lovie Smith. The Bucs (2-14) finished with the NFL’s worst record and are expected to select a quarterback with the first pick in April’s draft. Tampa Bay ranked 30th on offense this season under interim coordinator Marcus Arroyo.